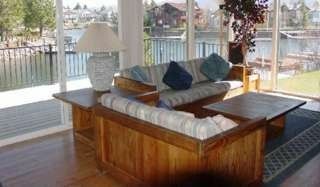 Ski In and Out, WiFi and flat screen TV's. 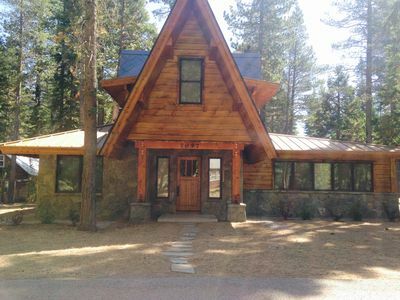 Lake View, Newer Build, Mountain home, Summer and Winter home, New beds, Luxury Furniture, Wolf Appliance, Wolf BBQ, Chef kitchen, Elevator for all levels, Large rooms, Location to Casinos. 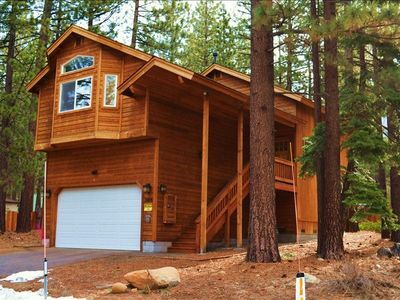 Enjoy the luxuries and comfort of home at this stunning mountainside gem. Every attention to detail has been observed in every bedroom, WiFi and a fax/printer/scanner. We also note that the window are tinted w/ screens on the ones that open. 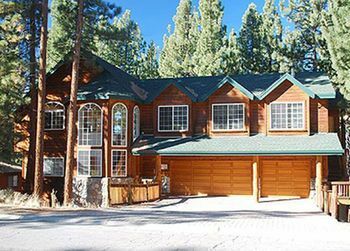 Our luxurious, custom crafted 4900’ home sits at the base of Heavenly California Lodge and is within walking distance of the ski lifts! 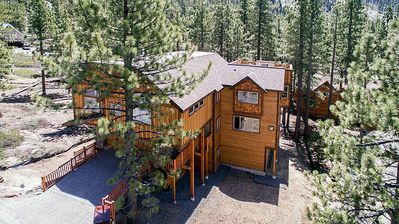 Built in 2012, the 5 bedroom, 4.5 bathroom home has four total levels, three living and all are served by a high speed elevator. There are a number of mesmerizing and artistic pieces by Peter Lik, Thomas Arvid and James Paul Brown upon first arrival of the home. 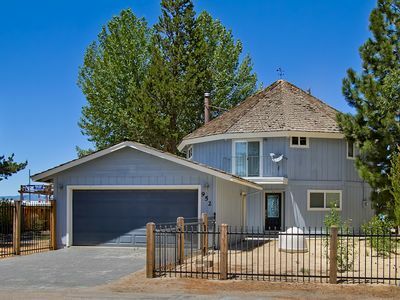 The craftsmanship and attention to detail makes this home stand out. The master suite beholds a Cal king, 46” 3D LED TV and a private bathroom with heated Travertine floors and a Jacuzzi tub. On this same floor is a bunk room which includes two over queen bunks. Enjoy watching shows and movies in the first floor media room on an 80” 3D flat screen LED TV with DVD and Klipsch surround sound. Wide plank hickory floors warm the floor of the great room on the second floor. 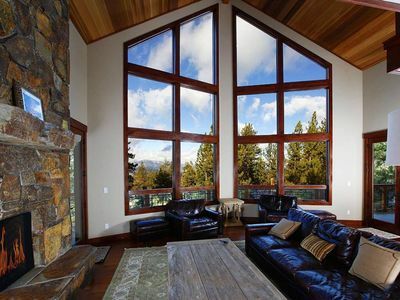 Here you can enjoy the 20’ ceilings and huge windows with majestic lake and mountain views. 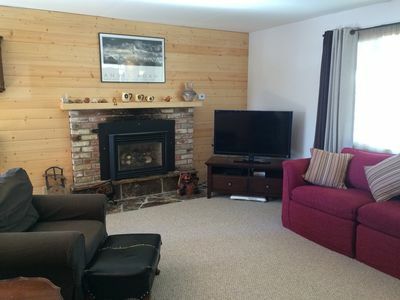 Relax in front of the fireplace after enjoying a meal in the dining room that seats 16. 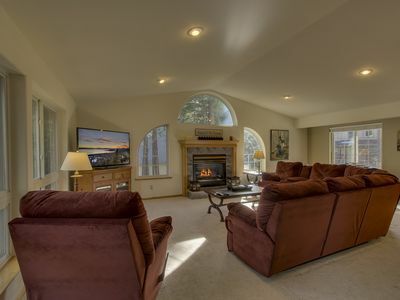 Adjacent to the living room is the chef’s kitchen with beautiful granite counter tops, a 48” Wolf range, wall oven, microwave and warming drawer. The kitchen comes fully equipped with cooking essentials for you to use with high end products and appliances. Another king master suite can be found on this floor. It includes a 46” 3D LED TV, private bath with heated Travertine floors, custom cabinetry and a Jacuzzi tub. Sliding doors lead way to a large deck. 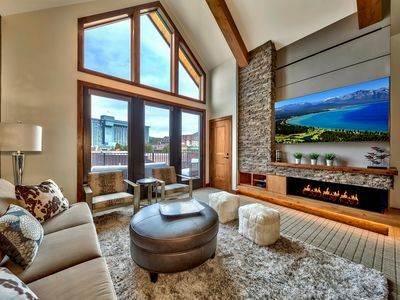 The third floor loft showcases a Connelly pool table, vaulted ceilings, 46” 3D LED TV, stereo, CD changer and stunning lake views. 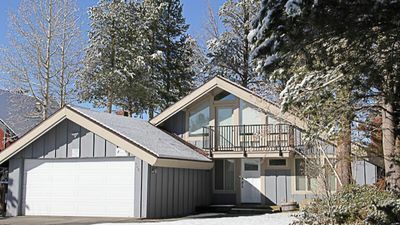 This floor includes a king master suite with clear cedar vaulted ceilings, fireplace, 46” 3D LED TV and has views of Lake Tahoe and East Bowls ski run as well as access to the outdoor decks. The private bath has heated Travertine floors, floor-to-ceiling shower and custom cabinetry. 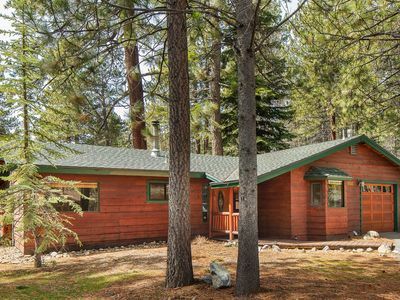 The other third floor bedroom has two queen beds, vaulted ceilings and gorgeous lake views. 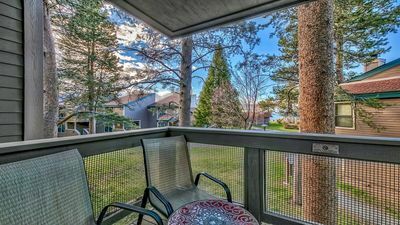 The front deck has panoramic views of Lake Tahoe through the tree tops. The private back deck on the second floor beholds a seven person hot tub and an outdoor kitchen. The kitchen includes a slate table with seating for six and a 42” built-in Wolf grill and granite counters. > Maximum parking at this property is 4 cars. No street parking. > Maximum Occupancy is 14. that includes all children per our city rules. > We are good neighbors, quiet hours from 10 pm to 8 am. All trash must be placed in the provided Bear Box. ** City will fine offenders for each violations to above. Fine is $2000 for individual violations. >Dogs OK. Fee is $75 per day per dog. Check out: There will be a $350 late fee charge if you check out later than listed for the home, unless it has otherwise been pre-arranged. At check-out, please put all perishables and food items in the refrigerator, turn off all lights/fans, close all windows and louvers, and place all trash in the outdoor trash cans in garage OR leave garbage bags in kitchen area. Please be certain that the entry key is in the lock box. Travel Insurance: We do not offer refunds due to schedule inconveniences. For a few extra dollars, we strongly suggest using a travel insurance company to ensure peace of mind. To help you find the right insurance for your needs, please visit the site: "Insure My Trip". 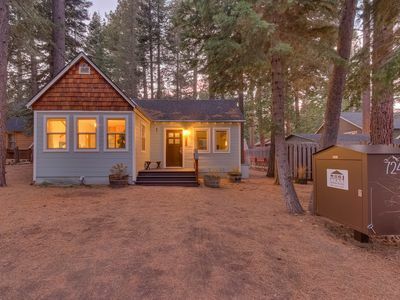 Use of Property: This home is in a quiet residential area. Parties or group entertaining are NOT permitted, and can be grounds for eviction. 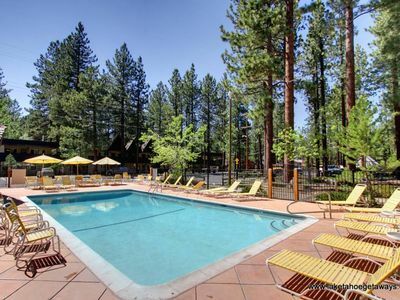 (NO Weddings, Bachelor or Bachelorette Parties at any of our locations) No commercial use of the property is permitted. If the owner has their boat on site, in no way are you allowed to touch, or enter or use for any reasons what so ever. 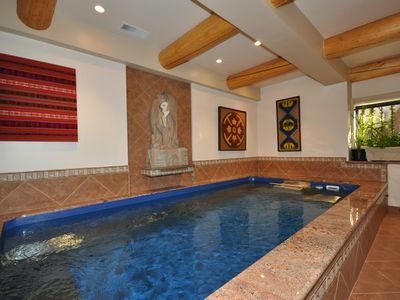 Hot Tub: For homes with a private hot tub. Use at your own risk. Do not remove brominator (floating disinfectant). Do not use if you are pregnant, have a medical condition or are under the age of 12. All children must be accompanied by an adult at all times. Supplies: A starter pack of paper goods and soap will be provided. Unlike a hotel, we do not replenish these supplies, and you are responsible for your own supplies during your stay. Each home has a coffee pot and basic kitchen pots and pans, dishes, flatware and glasses. Not all homes have cooking oil and spices. Please plan accordingly. Departure and Cleaning: The out cleaning charge is a specified amount shown on your receipt and NOT included in the rent. It is based on the understanding that tenants will leave the unit clean and tidy at departure; including kitchen, bathrooms, laundry area (in the condition that they found it on arrival). Any extraordinary cleaning or laundry resulting from a guest’s visit will be charged. Tenant agrees to keep the premises in a clean and sanitary condition, to exercise care regarding all furnishings and household items and to make no improvements or alterations. Tenant is advised NOT to move furniture, and NOT to take furniture cushions outside. BBQ must be left clean and not moved. Please replace cover on the BBQ once cooled down to protect it. Cooking Oil and Excess Grease: We love that you are using the kitchen to cook. We will be charging an extra cleaning fee for those who like to cook with oil/grease and do not clean up after doing so. Please make sure you have wiped all excess cooking oils and splatter from stove tops, walls, floors and even ovens or you will be charged a $100 extra cleaning fee. NO EXCEPTIONS. 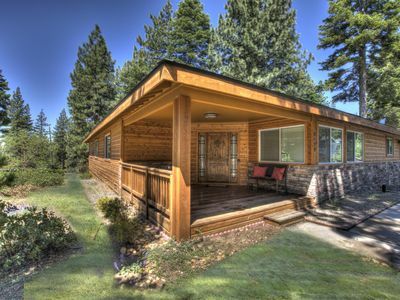 Non Smoking Property: NO SMOKING is permitted on, at, or in any part of the Property. If evidence of smoking is discovered or butts left on the property, the guest will be responsible for a $1000 fine associated with restoring the property to original condition and littering of cigarette butts. Keys: There is a charge of $50 per key for any keys NOT returned. There will be $175.00 charge to the tenant if we have to re-key any locks. Pet Policy: When pets are accepted (Sorry, no Husky / double coat type breeds allowed), the following terms, conditions, and restrictions will apply: If excess hair is left in home from pets you will pay an additional $100 cleaning fee. All pet droppings must be removed from the premises and disposed of prior to departure or pick up fee will apply. Guests are responsible for actions of their pets. Pets are not permitted to wander from the rental property, or in any way disturb neighboring properties or their residents. Should the welfare of the rental property or quiet enjoyment of any neighbor be compromised, you will be required to remove the pet from the premises. Should this occur, you remain responsible for fulfilling all other rental conditions and the financial commitment for the entire rental period. 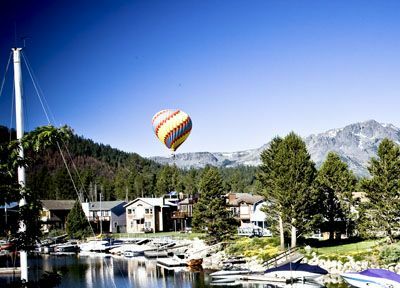 Tahoe does have wildlife and you should walk your pets with a leash at all time for you and your pet’s safety. Rubbish Disposal: Please remove trash from the house at least daily and place in the trash cans in garage if access. If not please do not set trash on the outside of your rental. This will help to control the bug/bear/raccoon population (they love trash). Pick up day is listed at your home, if you are staying in the home this date, please put in bear box on that day. If you leave trash behind, do not over stuff the black bags in the garbage bins, 2 white bags per 1 black bag. Surveillance Cameras: Are active and in the entryway and outside around the property perimeter. External Noise Meters: Are active outside of the property (front & back yards) Both devices are on & recording. 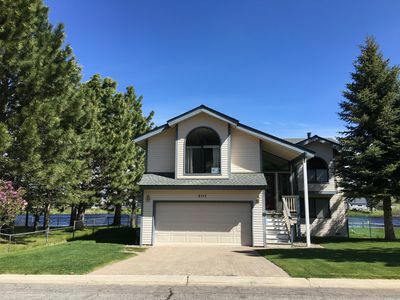 Acknowledgement: Tenant acknowledges that he/she has read, and understands and agrees to the House Rules listed, and agrees to abide by all stated restrictions on use of the property. Tenant understands that he/she is responsible for himself as well as all persons renting. If tenant (s) violate any of the House Rules, Home Owner reserves the right to evict tenants (in which tenant forfeits reservation expenses paid) and/or reserves the right to fine the tenant (s) a $2000 fine for violation of House Rules. 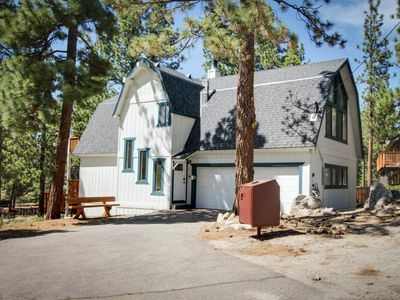 Home w/ game room, 2 blocks from Heavenly's California Lodge!